Long John Baldry was known for his long history of singing the blues starting in the early 60's with Alexis Korner's Blues Incorporated and a long line of other bands before breaking out into a successful solo career. 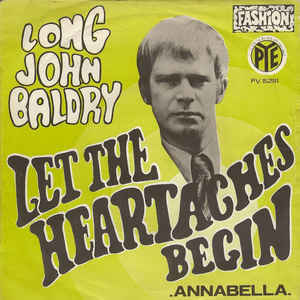 Yet, 50 years ago today, on November 22, 1967, Baldry had his biggest hit, sounding more like a crooner than a blues artist on "Let the Heartaches Begin". Written by Tony Macaulay and John Macleod, who also composed the number 2 record for the week, the Foundations' "Baby, Now That I've Found You", "Let the Heartaches Begin" stayed at number 1 for two weeks.